Dr. Paul Trintis, a 1999 graduate of University of Maryland School of Dentistry, immediately after graduation , established his practice in East Baltimore, serving many of the people of his native community. He spends his free time with his family and, an avid golfer, finessing his game every chance he gets. 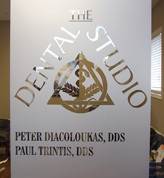 Dr. Peter Diacoloukas, a 2003 graduate of Maryland School of Dentistry, initially practiced general dentistry at The Dental Center for three years. Dr. Diacoloukas, also an East Baltimore native, enjoys the beach and traveling. committed to providing the best dental care and hygiene in a pleasant environment. We provide dental services to meet your dental needs in one convenient location and offer exceptional quality treatment from the time you walk in for your initial visit. Also, Spanish and Greek spoken here! Come to The Dental Studio and let us make your smile one of your prime assets!